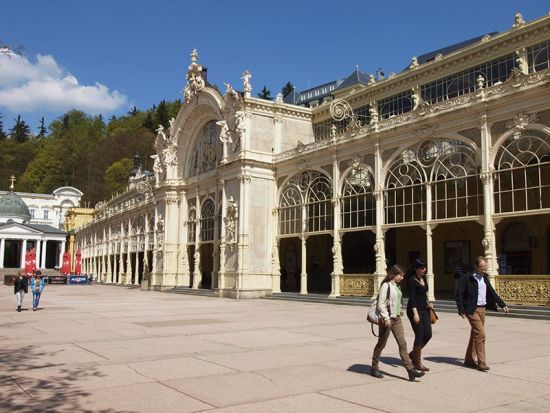 Eight times each day, even on Sundays, a train leaves the Czech town of Karlovy Vary for the 80-minute journey through the hills to Mariánské Lázne. Both communities are celebrated stops on the European spa circuit. They both flourished in Habsburg days and both are nowadays still well known by their erstwhile German names, respectively Karlsbad and Marienbad. I dream the dreams of so many travellers. My mind wanders. Not in a troubled way, but in that aimless, pleasant manner which often breeds good thoughts and new ideas. This is a kind of therapy. I am surprised to see that our train has gently slipped into a very different landscape. The valley sides are tilting more. Away to the left, looking down through the woods, I watch the sunlight bounce off the surface of a lake. We emerge from the forest and cross a golf course, stopping at the sixth tee. The station building at Cihelny has peeling yellow paint and broken windows, a contrast to the manicured fairways all around. What an odd spot for a station, right in the middle of a golf course. A hawk circles overhead. If ever I am tempted to take up golf, I'll head for Cihelny for this golf course tucked away in the beautiful valley followed by the slow train to Marienbad. 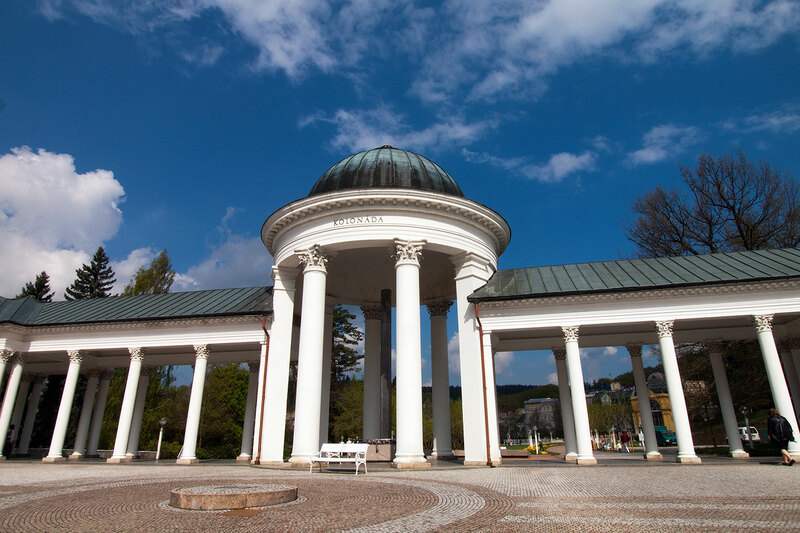 What is it about spa towns? They somehow stand apart from reality - little sanctuaries where the pressures of everyday life are kept at bay. If that's true of spa towns like Karlsbad and Marienbad, it is even more true of the train which trundles between them. This is one of those rural rail routes which are a refuge from modernity. Bar for the golf course at Cihelny, it is almost as if the twentieth century never happened. The whiskered stationmasters of the Habsburg era are long gone. But the peaked caps are still very much in evidence at all but the smallest halts (like that at Cihelny). Nowadays it is young women in smart uniforms wearing the peaked caps. These railway staff stand on the platform and look very official, checking their watches and waving an all-clear when it's time for the train to depart. At Vodná, one of many request stops on the line, we pause for a minute or two as an elderly lady alights from the train. She chats to two men on the platform, who take time out from chopping firewood for the coming winter. Wood is a serious business in these parts. And the Teplá Valley offers a fine mix of trees: birch, elm, sycamore, fir and pine. The 50-kilometre journey between the two spa towns is better than any spa treatment - the perfect way to end a long day's travelling. There are just a handful of other travellers on the train on this quiet Sunday afternoon. The most beautiful part of the journey is the stretch around the village of Teplá where the train slowly climbs out of the valley into the more expansive landscapes of the Bohemian uplands. Here the summer hay is being neatly baled and planks of wood are being stacked to season by the sides of barns. There is something mightily reassuring about wood. Still we continue to climb, until we reach the summit of the line at over 700 metres above sea level. And then it's down, down, all the way to Marienbad. On the way, we pause at a little halt called Milhostov. A man sits on a tree stump by the platform, virtuously whittling away at a piece of willow. "He's been there all summer doing just that," says the woman who checks tickets on the train. "We see him every day." Suddenly the appeal of golf fades. 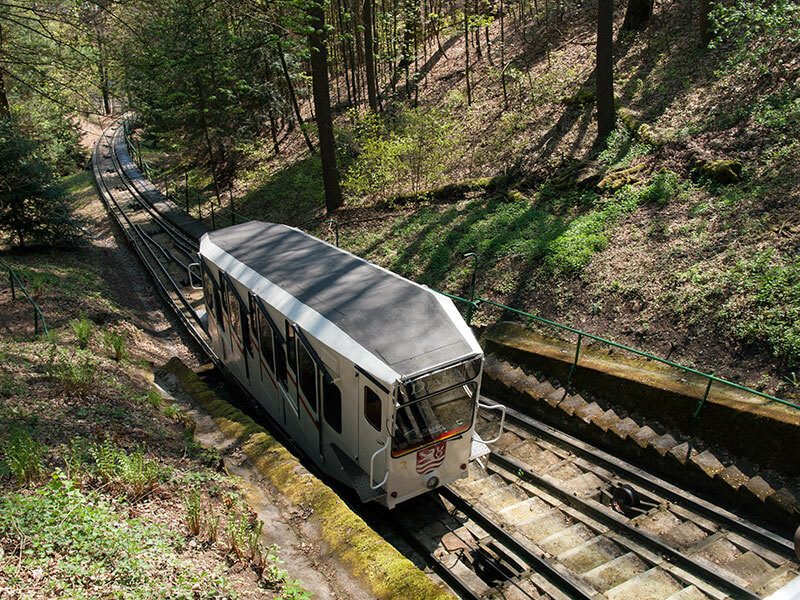 There are far better things to do in the hills of Bohemia.